Since introducing the world’s first change can mixer over 100 years ago, Ross recently continues to innovate and develop new solutions in mixing. Servicing virtually all the process industries, our mixer designs are continually evolving with various technologies and the real needs of our customers. In particular, growth in the Battery Industry has been one of the most important forces to propel our own success and we are proud to announce another milestone: over 280 Ross Planetary Dual Dispersers have now been supplied to the worldwide battery industry. Over a hundred of these mixers went to a single customer, one of the world’s largest suppliers of lithium ion batteries for consumer electronics. High viscosity dispersions are prepared in this mixer which features four agitators – two planetary stirrers and two high speed shafts – all rotating on their own axes while orbiting the mix vessel on a common axis. In addition to their fleet of Ross Planetary Dual Dispersers, this battery producer also uses over 50 other Ross equipment including Tank-Mounted Agitators and Dual-Shaft Mixers. 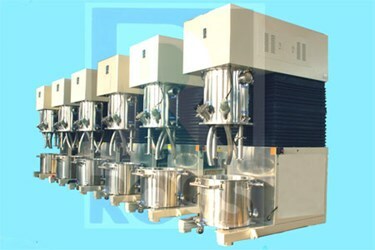 Ross supplies a full range of mixing, blending, drying and dispersion equipment to the battery industry including High Shear Mixers, Multi-Shaft Mixers, Double Planetary Mixers, Planetary Dispersers, Powder Injection Systems, Ultra-High Shear Mixers, Discharge Systems, Vertical Blenders, Cylindrical Dryers and Custom Agitated Vessels. These different types of equipment are installed in manufacturing facilities around the world for efficient and accurate batching of pastes, gels, slurries, solutions and powders used in various battery types and chemistries. To speak with a specialist about your battery mixing requirements, today. We understand that each formulation is unique and we work closely with every customer to match their processing objectives with the best mixing strategy.